Dr. Selgin has added a vertical line to indicate when the Fed imposed interest on excess reserves. I don't propose to discuss that here, since I have engaged in an interesting and spirited discussion with Dr. Selgin and others about it on both Forbes and Twitter. I am more interested in what else this chart shows. It is truly fascinating. The first thing to note is the fast rise in bank reserves from the latter part of 2008 onwards (blue line). This is due to emergency liquidity support and distressed asset purchases in the immediate aftermath of the 2008 financial crisis, and of course to QE. Unsurprisingly, there was a sharp fall in interbank lending at the time of the crisis. It recovered somewhat early in 2009, but then interbank lending fell again during the main phase of QE1. This is not surprising, since QE1 gave banks more than enough reserves to settle deposit withdrawals. They had no need to borrow from each other. Also during this time there was a considerable decline in bank lending, and a rise in purchases of safe assets (Treasury and Agency securities). Banks appear to have been substituting safe assets for risky ones. Reserves are, of course, safe assets. But it looks as if large though the reserves increase was, it wasn't enough to meet the needs of damaged, distressed and risk-averse banks - or substitute for the loss of private sector "safe assets" when the market valuations of private label RMBS and their derivatives collapsed. This chart is even more interesting than Dr. Selgin's. Firstly, the three phases of QE can be clearly seen (sharp rises on blue line). Large though the rise in bank reserves was after the financial crisis, it is dwarfed by subsequent rises, particularly QE3. 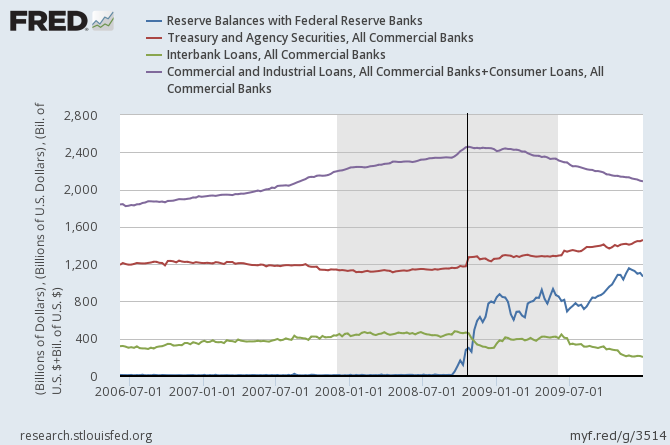 It also seems that despite the Fed's reinvestment policy, bank reserves decline slightly when QE ends. The sharp drop in reserves at the beginning of 2016 is due to the interest rate rise in December 2015, and in particular, due to overnight reverse repo operations (ONRRP) enabling certain non-banks to deposit funds at the Fed. When non-banks deposit funds at the Fed instead of commercial banks, the effect is a reserve drain. And the interbank market is all but dead. There is little doubt that this is due to the fact that QE gave bank far more reserves than they actually need to settle deposit withdrawals. 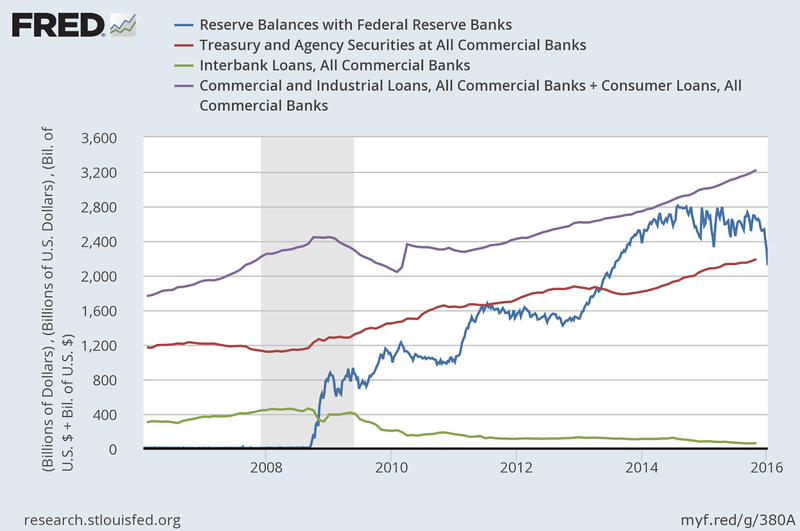 If banks don't need to borrow reserves, they can't lend them either: thus, when banks are awash with reserves, the natural level for the Fed Funds Rate is zero, regardless of the state of the economy. The December rise in the Fed Funds Rate was important for what it signalled, not for its economic effects. The principal instrument of monetary policy is now the interest-on-excess-reserves (IOER) rate (or deposit facility rate, if you are an ECB-watcher), which the Fed backs up with ONRRP operations. This will remain the case as long as there are excess reserves in the banking system - which may be for a very long time. Welcome to the new normal. Should the Fed have raised the IOER rate in December? Well, it had few alternatives. Since the interbank market is dead, it is not possible to raise the Fed Funds Rate by means of open market operations. Raising the IOER rate has the effect of drawing the Fed Funds Rate upwards. The only alternatives are unwinding QE or raising reserve requirements to near 100%. Unwinding QE would be a very sharp monetary tightening, but even more importantly, dumping all those securities on the bond markets would have dramatic and highly destabilising effects. The Fed has wisely ruled this out. The alternative would be raising reserve requirements to near 100%, thus creating artificial shortages of reserves. Do we want to go down the full-reserve-banking route? Some would like this. But the effects on commercial lending need to be considered carefully. At present, the Fed is not opting for this alternative. In the present circumstances, and absent a major change of policy direction regarding bank regulation, saying that IOER should not have been raised is tantamount to saying that the Fed's December Fed Funds Rate rise was a mistake. So banks don't lend to each other any more, much. But they do lend to non-banks. Despite QE, IOER and ever-tightening macroprudential regulation, bank lending to households and corporations has been rising steadily since 2012. Unlike Europe, the US fixed its banks quickly. It is clear that excess reserves do not prevent banks lending, and although there is something of a shortage of counterfactual evidence, it seems unlikely that paying IOER at a few basis points has much effect on bank lending either. But the really interesting feature of this chart is the red line. Bank purchases of Treasury and Agency securities have risen steadily since the financial crisis. The only time this tailed off was during QE3. The combination of large quantities of reserves with higher levels of Treasury and Agency securities suggests that banks have massively de-risked their balance sheets, no doubt under regulatory pressure to shore up capital and liquidity buffers. We have stopped short of full reserve banking, but banks are far better reserved and have much higher levels of capital than they did before the crisis. The price for this, of course, is increased dependence of banks on the sovereign. Substantial parts of bank balance sheets are now made up of sovereign liabilities, both reserves and securities. For the US, which is the world's premier sovereign reserve currency issuer, this is unlikely to be a problem. But in the Eurozone, bank dependence on sovereign liabilities is a problem - one to which as yet there seems no solution. The increasing proportion of sovereign liabilities on bank balance sheets - and the intrusive regulation that forces them to adopt such a risk-averse balance sheet management strategy - raises serious questions about the direction of policy. How can we pretend that banks are private sector agents, and demand that any losses are borne only by other private sector agents, when so much of their asset base is made up of public sector liabilities and so many of their activities are subject to public sector regulation? Far from making banks truly responsible for their own safety, we are creeping ever closer to de facto nationalisation. Any thoughts if UK banks are closer to US or Euro banks in this regard? Generally closer to US than Eurozone banks. This is for two reasons: firstly because of the Bank of England's more proactive stance on bank reform than European regulators, and secondly because like the US, the UK is a premier sovereign reserve currency issuer, unlike Eurozone member states. I will add my piece on the "premier league" currency issuers to the related reading list. A question that arises is whether fiscal policy can be effective if banks are the ones purchasing the safe government assets (assuming government spending is financed by bonds). If banks de-risk by hoarding government securities instead of rolling over lending to the private sector, can't the destruction of private credit more than offset any multiplier effects of the fiscal stimulus? The purchasing of TSY CDs after the fact is irrelevant to the fiscal effects and multiplier of Govt spending and taxing. The first order effect of a SS payment is that the recipient of the SS check receives an increase in their net worth, and the bank receives reserves to offset the increase deposit liability, so the bank's net worth is unchanged. Now if the bank buys a TSY CD with those reserves the bank's net worth is still unchanged (not counting the future positive interest income stream). The key point here is that the retiree still has that money that was deposited in their account and when they spend that money the magic of the fiscal multiplier kicks in. Regardless of whether they bank holds its assets in the form of reserves or TSY CDs in this example, the SS recipient still has the money to spend. And capitalism runs on sales. Careful there. A bank would not purchase the Treasury with reserves, or rather the banking sector in aggregate won't. Rather, the non-banking sector will get a bank deposit in return for the Treasury, meaning the banking sector expanded its balance sheet. So as a result of the whole process, we get a banking sector with the same amount of reserves (since spending was sterilized via bond sales) but a larger interest-producing balance sheet. If the banking sector is risk-averse and/or needs patching up its balance sheet, why wouldn't it then not stop rolling over some credit to the private sector, thus returning its balance sheet to the original size but destroying private credit in the process. Note that I'm not saying 1) It will necessarily happen or even if it does 2) That it will completely offset the fiscal multiplier effect. I'm just venturing the fact that it COULD. "Careful there. A bank would not purchase the Treasury with reserves, or rather the banking sector in aggregate won't." This is false. All TSY CD purchases are settled with reserves. So if a bank purchases a TSY CD, they exchange reserves for the CD, keeping their net worth the same. "Note that I'm not saying 1) It will necessarily happen or even if it does 2) That it will completely offset the fiscal multiplier effect. I'm just venturing the fact that it COULD." No it cant, thats why I laid out the accounting in my original response. No matter what the bank does with the reserves it receives from processing that SS payment, the SS recipient always has the extra income to spend. And when they spend that money, that when the multiplier kicks in. There is no multiplier when someone exchanges a checking account balance for a TSY CD or regular Commercial bank CD. In 2007, required reserves averaged $43 billion, while excess reserves averaged only $1.9 billion. This relationship was typical for the past 50 years when the Fed did not pay interest on reserves with only two exceptions. Those occurred when the Fed provided unusual levels of reserves to depository institutions in September 2001 following the terrorist attacks and in August 2007 at the onset of the global financial crisis. Other than those two months, excess reserves were less than 10% of total reserve holdings, because depository institutions had an incentive to minimize noninterest-bearing excess reserves held at the Fed." If my memory serves me correctly they passed this as a giveaway subsidy to the banks as the banksters were complaining that reserve requirements cost banks money since they cant put those reserves into an interest bearing alternative like with all their other reserves pre-QE. So Congress passed this little goodie where banks get paid for their RR in 2006. Unless you know something I dont where they've changed law or policy, IOR it should be. Back in the 18th and for well into the 19th The Royal Mint and its associates were not producing reliable specie anywhere near the amounts needed for ordinary purposes. This led to a wide range of shifts and devices, notably high interest debts, that were at the heart of the recurrent crashes and crises of those times. Governments simply did not understand the problem. So the suggestion that we are moving to what may become nationalised banks makes me very nervous indeed if we might be repeating the past. "..When non-banks deposit funds at the Fed instead of commercial banks, the effect is a reserve drain.."